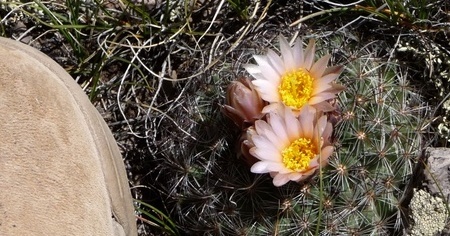 Tiny little barrel cactus flowers. That's the toe of my boot there for size comparison. Last month, May 20th, a Thursday, I drove from Denver to home. I stopped some 20 miles west of Gunnison to relax for a few minutes. The weather was gorgeous, but I was tired. I’ve always liked this particular stopping point because of the strange rock formations on the far north side of Blue Mesa Reservoir. Here's the view across the lake. Rather dramatic vertical rocks, hundreds of feet high. I walked toward the lakeshore and stumbled upon a curious thing. 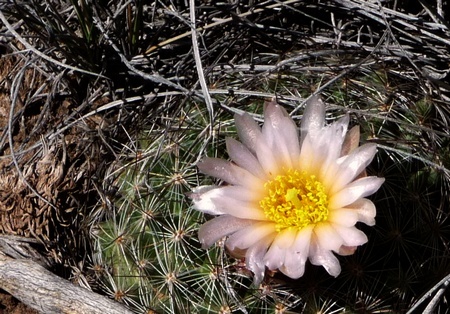 We’ve had a very wet spring, which can lead to cactus flowers (they don’t bloom every year). In fact, I found dozens of flowering cactus. They’re hard to see unless you look for them and are but tiny little things. Sort of a yellow-pink, kind of. The cactus it's blooming from isn't all that big either—just that round thing there. Here's a nice pink one—note boot toe for size comparison. 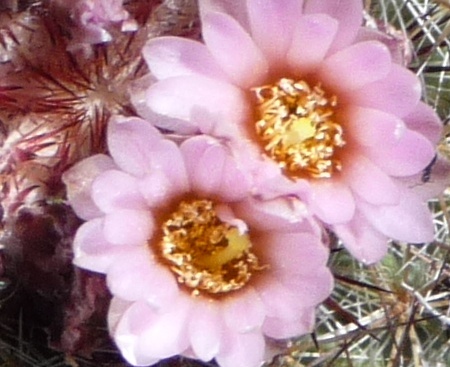 Even though the plant that bears these is prickly and hardy, the flowers are soft and delicate, almost as though made of wax. This entry was posted in Gunnison County, Wildflowers. Bookmark the permalink.